On Wednesday, April 16, 2014, at about 8:10 AM, 9 courageous anti-war activists were arrested at Creech AFB when attempting to serve a War Crimes Indictment (indictment below) to Creech AFB Commander Col. Jim Cluff. 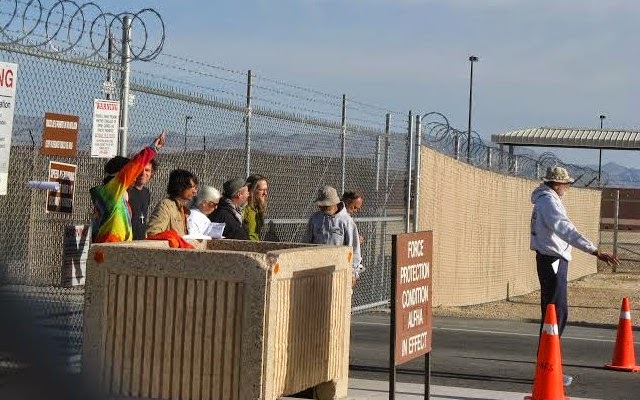 The 9 are members of the 2014 NDE Sacred Peace Walk which will end at the Nevada National Security Site on Friday, April 18, 2014. The illegality of the CIA “secretive cluster of units within the wing called the 732nd Operations Group” can no longer be denied or covered up. Hundreds of children have been murdered along with thousands of innocent men and women. The CIA is using Creech Air Force Pilots to carry out drone strikes in Pakistan. The War Indictment could not be delivered at a more timely moment. Vera, Anderson, Marcus Page, Robert Majors, Margaret McChesney, Brian Terrell, Seamus Knight, Barry Binks, Dan Shay and Darcy Ike in front. Each one of you, when you became a public servant, serving in a government position or when you joined the United States Armed Forces or police, you publicly promised to uphold the United States Constitution. This Treaty applies both collectively and individually to all three branches of government, on all levels, U.S. federal, state and local governments, starting with the executive branch: the U.S. President and the executive staff; the judicial branch: all judges and staff members of the judiciary; the legislative branch: all members of the U.S. Armed Forces and all departments of Law Enforcement and all civilian staff, who have sworn to uphold the Constitution, which includes Article VI. Under the U.N. Charter and long established international laws, anyone–civilian, military, government officials, or judge- who knowingly participates in or supports illegal use of force against another nation or its people is committing a war crime. Today you must recognize that when you promised to uphold the Constitution, you promised to obey Treaties and International Law – as part of the Supreme Law of the Land and furthermore, under the Uniform Code of Military Justice of the U.S., you are required to disobey any clearly unlawful order from a superior. WE, THE PEOPLE, CHARGE THE UNITED STATES PRESIDENT, BARAK OBAMA AND THE FULL MILITARY CHAIN OF COMMAND TO COMMANDER COLONEL JIM CLUFF, EVERY DRONE CREW, AND SERVICE MEMBERS at CREECH AIR BASE, WITH CRIMES AGAINST PEACE & CRIMES AGAINST HUMANITY, WITH VIOLATIONS OF PART OF THE SUPREME LAW OF THE LAND, EXTRAJUDICIAL KILLINGS, VIOLATION OF DUE PROCESS, WARS OF AGGRESSION, VIOLATION OF NATIONAL SOVEREIGNTY, AND KILLING OF INNOCENT CIVILIANS. We charge that the United States Air Force, headquartered at Creech Air Force Base, home of the of the 432nd Wing and 432nd Air Expeditionary Wing, Commander Colonel Jim Cluff, is maintaining and deploying the MQ-9 Reaper robotic aircraft, called drones. These drones are being used not only in combat situations for the purpose of assassinations but also for killings far removed from combat zones without military defense, to assassinate individuals and groups far removed from military action. It is a matter of public record that the US Military has used drones in Afghanistan and in Iraq for targeted killings to target specific individuals which has nearly always resulted in the deaths of many other non-targeted innocents. Recent evidence has come forth indicating the personnel at Creech AFB also have used drones similarly in Pakistan, Yemen and Somalia for the C.I.A. There is no legal basis for defining the scope of area where drones can or cannot be used, no legal criteria for deciding which people can be targeted for killing, no procedural safeguards to ensure the legality of the decision to kill and the accuracy of the assassinations. The drone attacks either originating at Creech or supported here are a deliberate illegal use of force against another nation, and as such are a felonious violation of Article VI of the US Constitution. By giving material support to the drone program, you as individuals are violating the Constitution, dishonoring your oath, and committing warcrimes. We demand that you stop participating in any part of the operations of MQ-9 drones immediately, being accountable to the people of United States and Afghanistan. As citizens of this nation, which maintains over 700 military bases around the globe, and the largest, most deadly military arsenal in the world, we believe these words of Martin Luther King still hold true, ”the greatest purveyor of violence in the world today is my own government”. 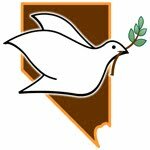 On Wednesday, April 16, 2014, between 6:30 and 8:00 AM, the Sacred Peace Walk conducted by Nevada Desert Experience (NDE) will serve a War Crimes Indictment to Creech AFB Commander Colonel Jim Cluff. The Indictment can be viewed online. Arrests seem likely when Sacred Peace Walk Representatives attempt to deliver this indictment in person. There will also be a vigil in front of the base. In light of yesterday’s breaking revelations about the “secretive cluster of units with the wing call the 732nd Operations Group”, where the CIA is using Creech Air Force Pilots to carry out drone strikes in Pakistan, NDE’s War Indictment could not be delivered at a more timely moment. Clearly the illegality of the largest targeted drone killing program can no longer be denied or covered up. “We also are here to call upon the airmen and airwomen to consider the spiritual impact of the horrifying physical violence conducted by Creech AFB,” said NDE Council member Marcus Page-Collonge. When tribal elders from the remote Pakistani region of North Waziristan travelled to Islamabad last week to protest against CIA drone strikes, a teenager called Tariq Khan was among them. A BBC team caught him on camera, sitting near the front of a tribal assembly, or jirga, listening carefully. Four days later he was dead – killed by one of the drones he was protesting against. His family told us two missiles hit the 16-year-old on Monday near Miranshah, the main town in North Waziristan. His 12-year-old cousin Wahid was killed alongside him. The boys were on their way to see a relative, according to Tariq’s uncle, Noor Kalam, who we reached by phone. The CIA’s drone campaign is a covert war, conducted in remote terrain, where the facts are often in dispute. The tribal belt is off limits to foreign journalists. Militants often seal off the locations where drone strikes take place. The truth can be buried with the dead. After the missile strike on Monday, Pakistani officials said four suspected militants had been killed. If the strike actually killed two young boys – as appears to be the case – it’s unlikely anyone will ever be held to account. There are no confirmed death tolls but several independent organisations estimate that drones have killed more than 2,000 people since 2004. Most are suspected to be militants. Many senior commanders from the Taliban and al-Qaeda are among the dead. But campaigners claim there have been hundreds of civilian victims, whose stories are seldom told. A shy teenage boy called Saadullah is one of them. He survived a drone strike that killed three of his relatives, but he lost both legs, one eye and his hope for the future. Like Tariq, Saadullah travelled to Islamabad for last week’s jirga. Seated alongside him was Haji Zardullah, a white-bearded man who said he lost four nephews in a separate attack. Asghar Khan, a tribal elder in a cream turban, said three of his relatives paid with their lives for visiting a sick neighbour. Viewed from a drone, any adult male in the tribal areas can look like a target, according to Mirza Shahzad Akbar, a Pakistani lawyer who is taking on the CIA. Mr Akbar is suing the CIA for compensation in the Islamabad High Court, and plans to file a Supreme Court action. He claims the US is getting away with murder in North Waziristan. It’s a view shared by the British legal charity Reprieve, whose director, Clive Stafford Smith, has been meeting drone victims in Pakistan. “What’s going on here, unfortunately, is murder,” he said. The CIA would doubtless say otherwise, if it were prepared to discuss the drone programme, but US officials are usually silent on the issue. In a rare public comment two years ago, the then director of the CIA, Leon Panetta, defended the use of drones. But the damage is not limited enough, say opponents like Mr Stafford Smith, who is gathering evidence about civilian deaths. From a shopping bag he produced a jagged chunk of metal – a missile fragment – believed to have killed a child in Waziristan in August of last year. “I have a three-year-old son myself, and the idea that this thing killed someone very much like my little Wilf really tugs at your heart strings,” he said. Mr Stafford Smith says drones are changing the nature of modern warfare. “If you are trying to surrender and you put your hands up to a drone, what happens?” he asks. Campaigners also warn that drone strikes are counter-productive, generating more radicalism and more hatred of the West. They say the drone strikes are a Taliban recruiting tool. At Tariq Khan’s funeral, many mourners spoke out against the US, according to his uncle Noor Kalam. But Washington is unlikely to heed the anger here. Under President Barack Obama, the use of drone missiles has soared – there’s an attack on average every four days. Increasingly, these remote-controlled killers are Washington’s weapon of choice. The Obama administration has found a good way to avoid both the domestic political and international fallout that comes of waging constant warfare: let machines do the dirty work. Of course, the Obamaites don’t get the full credit for the discovery – drone attacks in Afghanistan and Pakistan were part of the Bush team‘s strategic plan, but the Obama White House has gone much further in utilizing this tactic to escalate and extend American military operations around the world, and they’re doing it in secret – without congressional oversight, without public debate, and without the knowledge or consent of the American people. The theater of operations is vast – potentially as vast as the world itself, given the rationale of pursing “terrorists” wherever they might be detected – and, so far, the range extends from the tribal regions of Pakistan to the African savannah, where pilotless “Reapers” take off from airfields in Ethiopia and Djibouti in search of prey. According to reports, US bases have also been established in Saudi Arabia and the Seychelles for this purpose. The latter, I hear, are quite happy about what this has done for local business: Americans may be standing in the unemployment lines, while their taxes go to fund endless war, but the Seychellois are in relatively good shape these days. In any case, the latest targets of these unmanned killer-drones are located, as far as we know, in Somalia, where the Islamic group al-Shabab is alleged to have some vague ties to al-Qaeda. But that’s just what they’re telling us: because this is a secret war, we don’t know the real targets. It is highly likely, however, that among those targets are numerous rebel groups rising against the tyranny of Ethiopian “president” Meles Zenawi. CIA drone strikes have led to far more deaths in Pakistan than previously understood, according to extensive new research published by the Bureau. More than 160 children are among at least 2,292 people reported killed in US attacks since 2004. There are credible reports of at least 385 civilians among the dead. In a surprise move, a counter-terrorism official has also released US government estimates of the numbers killed. These state that an estimated 2,050 people have been killed in drone strikes – of whom all but an estimated 50 are combatants. "No collateral damage due to drones"